The Spin: While Nucky politics in Chicago at the Republican National Convention, his brother gets shot back in AC, forcing him to call on the only person he can trust, Margaret, to protect his ledger. Meanwhile, he recruits Jimmy to come back home, political alliances are formed, and we get a deeper glimpse into Agent Van Alden’s sterile family life. Brian Kirk’s lethargic direction drowns out this Meg Jackson penned episode where much happens, but it all feels a little bit sleepy. My favorite parts: Warren G. Harding’s bloviating and corruption laid bare, Nucky’s urgent call to Margaret, Van Alden’s cruel letter to his wife, and Margaret’s peek into the ledger. Wait Until Next Week: Will Jimmy’s return to AC put a damper on his honey’s plan to go to NYC with her gal-pal/lover and squash her plans to sell her paintings? Can Nucky really trust Margaret? How far off the handle will Lucy fly? This entry was posted in Boardwalk Empire: Complete Episode Guide, Pop Culture, Television and tagged Atlantic City, Boardwalk Empire, Boardwalk Empire Blow by Blow Episode Guide, Brian Kirk, HBO, Hold Me In Paradise, Kelly Macdonald, Meg Jackson, Michael Pitt, Mobsters, Nelson Johnson, Prohibition, Shea Whigham, Steve Buscemi, Terence Winter, The 1920's, TV Series. 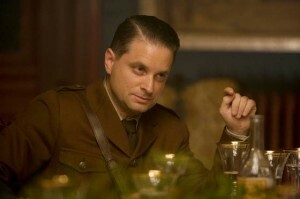 The shooting of Nucky’s brother may be triggering a lot more bloodshed in upcoming episodes. I think Jimmy will come back to AC. As for our favorite IRS agent, Van Alden, well the constipated old boy just continues to be emotionally sterile, ice cold and just plain strange.